When I look back on the things that have shaped and affected my perspective of being farted out on this revolving mud ball, there are several film directors I owe great thanks. One is Stanley Kubrick whose 2001, A Space Odyssey blew my young mind. When I first saw the film at the age of 10, a screaming acid-drenched longhair rushed at the theater’s screen, and tried to get through to God or Satan by pulling at the screen’s fabric. Cinemas became our church of a sort enabling us to think much further beyond the mundane facts and figures taught in the public school. There were the British guys like Nic Roeg, Lindsay Anderson, and Ken Russell, who mixed the profound with the silly. David Lynch, whose films taught me a lot about pace and setting. The French dudes, who challenged my patience. Then there were the Germans. Particularly the work of Herzog and Fassbinder. Throughout the ‘70s, both in high school and college I “reviewed” movies for school newspapers. This was the ‘70s, the apparent classic period of risk and experimentation. I must admit that expansive largeness of Kubrick spoiled me a bit for the smaller, emotional set pieces seen in Fassbinder’s films. I misinterpreted their intimacy for a smallness of gesture. It wasn’t until later that I began to dislike the shallow bombast of “big” American films, and appreciated the emotional risk and despair seen in Fassbinder’s work. After I moved to New York City in ’81 and landed a job working for the small publisher of theater books, I was lucky enough to be able to work on a book of Fassbinder’s plays, both in an editorial mode, and also as its typesetter, obtaining a couple halftones and later waxing down the text on boards for the printer. 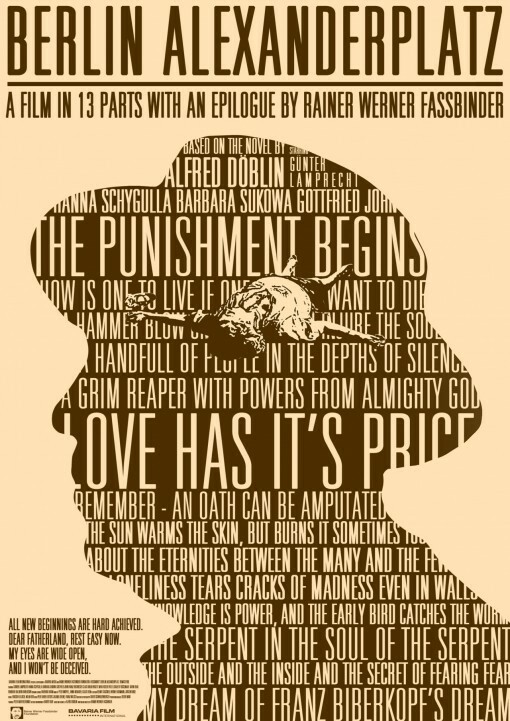 These plays, which Fassbinder wrote and directed and sometimes performed, happened prior to the time he directed films. A few of them actually became films. I made a point to watch the 14-part film, Berlin Alexanderplatz as it played on PBS television for several months. This tragedy that pictured the city itself as the villain… complete with a dreamlike epilogue that was Fassbinder’s response to Döblin’s novel. It was all filmed so darkly, one often had to squint to make out what was going on on the television set. Fortunately, Criterion came along and published the entire series on DVD, restoring it to its intended look. Not too dark. The DVD set includes great extras, such as a documentary on the making of the film, showing Fassbinder and his actors in action. Along with the recent Jodorowsky’s Dune, this half-hour doc is a very revealing look at the compulsive and efficient way that an excellent film director worked. Highly recommended for the non-suicidal among us.